Through 230,000 interviews across the globe, Market Authority has studied consumer usage from interviews concerning current local business search trends. We craft a unique combination of surgically targeted research, and state-of-the-art sales training into a proven method to help companies navigate and overcome objections relating to traditional media usage. This training delivers increases in revenues and profits to publishers as advertisers make better decisions through accurate local usage information. 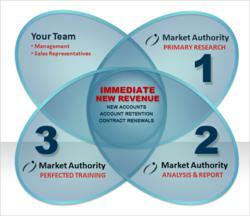 Market Authority provides your company with exactly what is necessary to drive new account activity, retain print ad clients, and increase campaign renewals immediately. “This is the most effective training I have ever attended” said Jason Parnwell, Marketing Executive, Yell Group. MA has recently added the United Kingdom and Australia to its list of countries studied and found that Internet users believe print usage has fallen precipitously. However, overall usage remains high, especially among key demographics that print advertisers’ covet: older household owners with higher income levels. This information, combined with MA’s one-of-a-kind sales training, delivered a powerful message to several hundred employees of Yell Group selling in the London area. “This is the most effective training I have ever attended” said Jason Parnwell, Marketing Executive, Yell Group. MA has also conducted extensive research into mobile marketing and offers cutting edge sales training in this industry as well. Market Authority provides the most effective sales support and training in the print yellow pages, mobile, and online industries. With over 230,000 interviews conducted, MA is the world’s authority on how individuals look for and find a local business. To contact Market Authority to study your market or train your sales force, please contact Kari Simpson or Megan Hartwig, DMI at 816-537-7950. Market Authority, Inc. has conducted interviews with over 230,000 consumers across the world in the last 20 months to study their technology and media habits when looking for a local business. This vast wealth of current consumer information gathered from over 275 cities makes Market Authority, Inc. the leading authority on the reality of usage in print and digital platforms. The research includes analysis of new media (search engines, online Yellow Pages, group buying sites, mobile browsing, SmartPhone ownership, mobile marketing, etc.) and traditional media (print Yellow Pages, newspapers, etc.). The results of the nationwide study continue to evolve and change as Market Authority, Inc. surveys consumers in urban, suburban and rural demographics across the globe.